Over 50 million children worldwide are currently suffering from severe acute malnutrition (SAM), whereas almost one-third of them have been facing the most extreme consequences of malnutrition. To add to this fact, around a million kids between the age of six months and five years die malnourished. In order to provide such kids with the necessary specialised feeding care, ready-to-use therapeutic food serves the best solution. Ready-to-use therapeutic food (RUTF) is high energy fortified food that is predominantly used in the treatment of SAM. 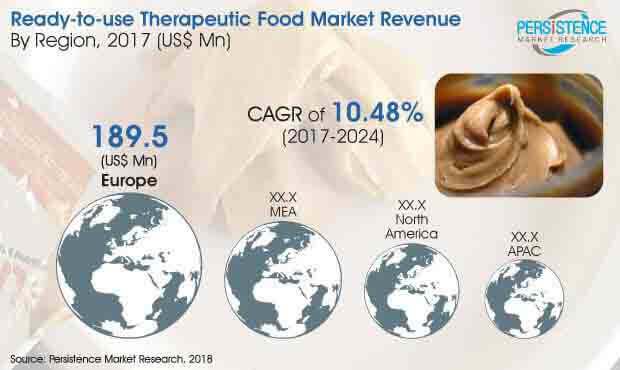 The US$ 307.3 Mn global ready-to-use therapeutic food market is slated to reach over US$ 617 Mn by the end of 2024. The market is expected to observe exponential growth at a robust CAGR of around 10.5% over a seven-year forecast period, 2017-2024. As RUTF tends to deliver rapid weight gain while the children are still recovering, it has been the top nutrition alternative recommended by the WHO, UNICEF, WFP, and UNSSCN for malnourished kids worldwide, over the years. A few emerging economies in the Asia Pacific region and some of the African countries register a significant rate of malnutrition and thus constantly fuel the demand for RUTF. Several organisations, teaming up with a variety of initiatives funded by governments, are increasingly taking efforts in raising funds for buying and distributing RUTF products in underprivileged Asian and African countries. UNICEF is encouraging R&D of innovative raw materials and domestic production of ready-to-use food products, which is identified to be a major driver to the market growth. Surging awareness about combating malnutrition and strong support from government as well as non-government entities from across the world will stand to be the most impactful factors improving the performance of the global ready-to-use therapeutic food products in near future. However, expensive prices of RUTF products may continue to impose financial pressure on individuals, governments, and non-government bodies across developing economies. As per the regional analysis, Europe and MEA are and will remain the key markets, whereas North America is slated to thrive at a healthy double digit growth rate over the assessment period. Regional players in the European market are the key suppliers of RUTF to UNICEF and other leading organisations. Maximum manufacturing facilities are sophisticated enough and are now under the process of expansion. Attributed to this, Europe is estimated to exhibit robust production and revenue generation, and in turn healthy growth. Local governments in MEA are increasing budget for malnutrition treatment, whereas regional governments are taking efforts to establish manufacturing facilities. As a result, the revenue contribution from MEA will however be relatively higher during the forecast period. In APAC, the implementation of CAMAM in Asian countries is propelling demand. APAC and MEA expected to expand vigorously, owing to the highest number of opportunities through to 2024. On the basis of product type, the global market for ready-to-use therapeutic food is segmented into three key segments, including solid, semi-solid paste, and drinkable therapeutic food. Solid RUTFs are available as powder, biscuits, and candy bars, which can be consumed directly from the packet or even mixed with drinking water to consume as a porridge. Owing to steady demand for solid products, the market is likely to witness a lot of product innovation resulting in rapid growth of the market. Semi-solid paste segment is presumed to remain the dominant segment throughout the assessment period and will possibly thrive at an impressive CAGR of over 10%. Drinkable ready-to-use therapeutic foods are the beverages fortified with vitamins and minerals specifically to treat SAM. Following the UNICEF’s emphasis on increased procurement of drinkable RUTFs announced recently, the drinkable RUTF segment is apprehended to witness robust growth through to 2024.